Move over Lightning McQueen! Tow Mater was in the spotlight of Cars 2. I shared the same sentiments with others that this movie feels like James Bond 007 with Mater. 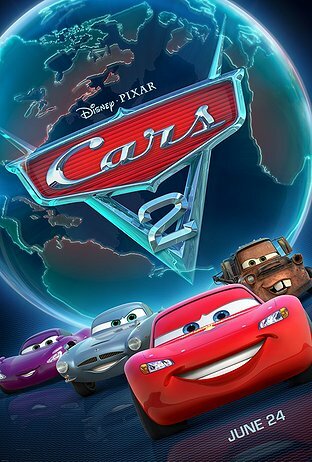 Cars 2, it emphasizes the importance to let us be who we are and not pressure by peers. Cars 2 plot is minimal compared to the first original Cars. The first original Cars has a huge moral to the plot and we feel sympathy towards the characters. Mater got Lightning McQueen dared into racing in World Grand Prix. Both of them then jet-setting to Japan, Italy and United Kingdom. Mater, being goofy Mater, embarrassed Lightning McQueen, being at the wrong place at the right time and got caught up with international espionage. Mater has all the good jokes in the script. The CGI was amazing especially the scenes in Japan and Italy. No one can resist trying to make the Queen’s Guard to move a muscle, including Mater. I hate to give such a low grade on a Pixar film especially when I always have high expectation from them, but it just wasn’t that good overall.